I've requested the same simple birthday cake every year since I was teenager. It's a recipe from the Pittsburgh Post-Gazette for a buttermilk lemon cake that my mom clipped and slightly modified. It's nothing elaborate—just a dense yellow cake adorned with lemon glaze that soaks into the crumb over a few days, rendering the outer edges something weirdly akin to a crispy lemon fudge and leaving the interior core dense and moist but still cakelike. It wasn't my birthday this weekend, but it was Mother's Day, and I had to contribute something to the Peterson Garden Project's bake sale (an organization you should support if you support growing your own food). So I (i.e., the missus) contributed a cake and a half to the sale, reserving half for our own selfish purposes. An interesting development occurred. We failed to turn the first cake right-side up after removing it from the pan and glazed it on the bottom, where the uneven surface allowed for deeper penetration of syrupy goodness. Compared to a proper right-side-up cake, there was no question that the first was superior. The key is to make this cake a few days before serving, allowing it to achieve a density close to tungsten. 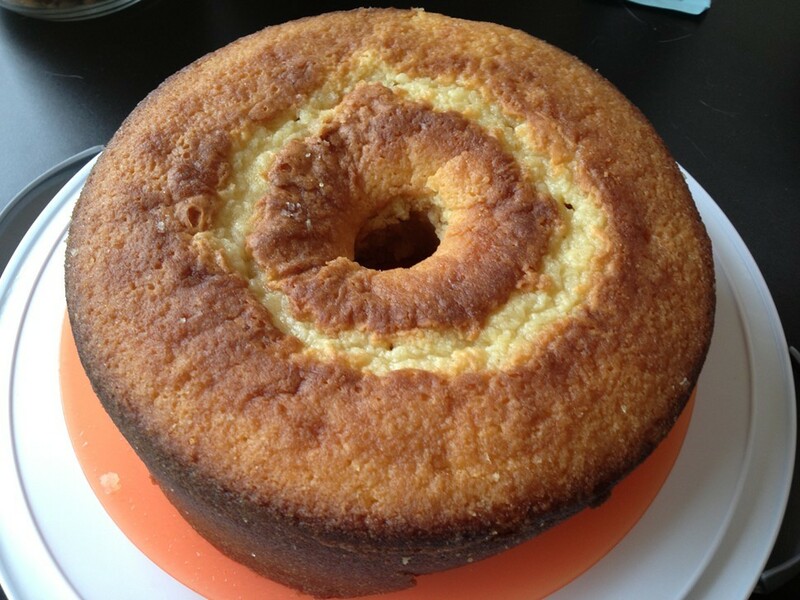 For a boozy cake try substituting limoncello for the glaze. Butter an angel food cake pan and coat with the bread crumbs. Line bottom of pan with parchment paper. Mix zest and lemon juice together and set aside. Sift together flour, baking soda, and salt and set aside. In an electric mixer, cream butter. Add sugar slowly and beat for three minutes. Add eggs one at a time, beating after each addition, then beat for another three minutes. Add flour mixture, a third at a time, alternating each addition with half the buttermilk. Put the mixer on its lowest speed, and add the lemon juice and zest. Spoon batter into prepared cake pan. Bake on a rack in the center of the oven for 90 minutes, or until the top is dry and a wooden pick inserted in the center comes out clean. While cake bakes, make the glaze: mix lemon juice, water, and sugar in a small bowl and set aside. Remove cake from oven and let it cool for five minutes. Remove cake from pan (leave it upside-down) and apply glaze to bottom and sides with pastry brush until absorbed. Let it stand until cool.